Here’s how it works. 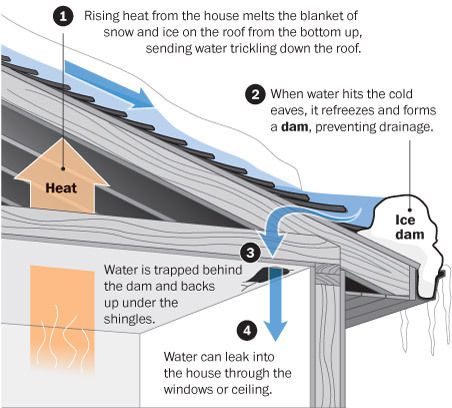 After a storm, ice can form along the eaves, skylights, chimneys, and roof vents of a house. This build-up counters the slope of the roof, catching water and debris. Ice & water shield membrane placed in a critical leak area offers weather-tight protection against the collected water, keeping it out of the attic and the rest of the house. Chimneys and skylights will typically trap water so metal back pans and crickets are used to keep the water sloping down and around them in conjunction with an ice & water shield. A lot of homeowners are having contractors use the protective membrane at roof hips, ridges, and valleys as well for additional protection in all critical leak areas. National roof code indicates the requirement for ice and water shield must extend a minimum of 2 ft up from edge of roof eaves. Typically, contractors suggest at least 3 ft or more as the material comes in 3 ft wide rolls. Doubling the width to 6ft (with slight overlap between the two sheets) will create a better performing roof system and is typically required for upgraded warranties (for a roof system as a whole) with most roofing material manufacturers. GAF Materials Corporation holds superb warranties on their roof systems with the correct installation of leak barrier membrane by a certified contractor. The Weather Stopper® System Plus limited warranty covers the first 50 years for 100% coverage against manufacturing defects including cost of installation labor when using a Lifetime Architectural & Designer shingle system (20 years on 3-tab systems). This system includes placing ice and water shield (GAF Weather Watch®, StormGuard®, & UnderRoof™) in valleys and around all penetrations of the roof. The deluxe warranty offered by GAF, Weather Stopper® Golden Pledge covers the above stated with the addition of workmanship coverage. This includes 100% coverage for misapplication for 25 years (20 years on 3-tab) and includes tear-off and disposal costs if a replacement is necessary. Ice and water shield must be properly installed in valleys, around all penetrations and doubled to at least 2 ft beyond the warm wall (exterior wall) for houses at 1500 ft elevation and higher. This leak barrier is not necessarily required along roof rakes, but is generally recommended by certified GAF installers. As a local Tacoma certified roofing contractor, we keep the water out of your house with the correct application of leak barrier membranes, and that’s why we’re a Master Elite Contractor with GAF Materials Corporation, proudly offering Weather Stopper® System Plus & Golden Pledge systems. 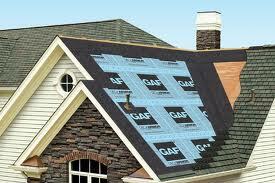 We specialize in composition shingle systems and low slope roofs. Call us at 253-445-8950 for a free estimate or with questions regarding roof system warranties. You can also drop by our website at http://www.chasenw.com. Great blog. Very informative and easily readable. Keep it up!! Great piece on an ofter overlooked component of a roofing system. It is good to see a good quality website providing valuable information about proper roofing products.